The American military — once a staunch supporter of President Bush and the Iraq war — has grown in creasingly pessimistic about chances for victory. For the first time, more troops disapprove of the president’s han dling of the war than approve of it. Barely one-third of service members approve of the way the president is handling the war, ac cording to the 2006 Military Times Poll. Only 35 percent of the military members polled this year said they approve of the way President Bush is handling the war, while 42 percent said they disapproved. The president’s approval rating among the military is only slight ly higher than for the population as a whole. In 2004, when his popularity peaked, 63 percent of the military approved of Bush’s handling of the war. While ap proval of the president’s war lead ership has slumped, his overall approval remains high among the military. Just as telling, in this year’s poll only 41 percent of the military said the U.S. should have gone to war in Iraq in the first place, down from 65 percent in 2003. That closely reflects the beliefs of the general population today — 45 percent agreed in a recent USA Today/Gallup poll. Professor David Segal, director of the Center for Research on Mil itary Organization at the Univer sity of Maryland, was not sur prised by the changing attitude within the military. “They’re seeing more casualties and fatalities and less progress,” Segal said. A chunk of ice bigger than the area of Manhattan broke from an ice shelf in Canada’s far north and could wreak havoc if it starts to float westward toward oil-drilling regions and shipping lanes next summer, a researcher said on Friday. Global warming could be one cause of the break of the Ayles Ice Shelf at Ellesmere Island, which occurred in the summer of 2005 but was only detected recently by satellite photos, said Luke Copland, assistant professor at the University of Ottawa’s geography department. Full text of Al Gore’s SNL skit from May is under the fold, and video is at Crooks and Liars. In this afternoon’s news, Saddam Hussein is still dead.Three thousand American soldiers are still dead, with over 46,000 injured. Over 600,000 Iraqis are still dead and there are over 3 million refugees. In related news, Osama bin Laden, who George Bush promised to get “dead or alive,” is still alive. Dear Dr. Dobson:I am writing to ask that you cease and desist from quoting my research in the future. I was mortified to learn that you had distorted my work this week in a guest column you wrote in Time Magazine. Not only did you take my research out of context, you did so without my knowledge to support discriminatory goals that I do not agree with. What you wrote was not truthful and I ask that you refrain from ever quoting me again and that you apologize for twisting my work. From what I understand, this is not the first time you have manipulated research in pursuit of your goals. This practice is not in the best interest of scientific inquiry, nor does bearing false witness serve your purpose of furthering morality and strengthening the family. Finally, there is nothing in my research that would lead you to draw the stated conclusions you did in the Time article. My work in no way suggests same-gender families are harmful to children or can’t raise these children to be as healthy and well adjusted as those brought up in traditional households. I trust that this will be the last time my work is cited by Focus on the Family. Washington, DC — Grand Canyon National Park is not permitted to give an official estimate of the geologic age of its principal feature, due to pressure from Bush administration appointees. Despite promising a prompt review of its approval for a book claiming the Grand Canyon was created by Noah’s flood rather than by geologic forces, more than three years later no review has ever been done and the book remains on sale at the park, according to documents released today by Public Employees for Environmental Responsibility (PEER). SciFi Friday: Billie Piper Gone from Doctor Who, Is David Tennant Leaving Too? One fun thing about Doctor Who is that we can travel in time. I don’t mean on the show, but that we can see what happens on the tv series in the future since it is broadcast in Great Britain before in the United States. Last week many of us already knew that it would be the final appearance of Rose, who was trapped in a parallel universe during the invasion of Earth by the Cybermen and Daleks in the second season finale. A Christmas episode, not yet aired in the United States, picks up where the finale ended with the bride who appeared aboard the Tardis in the final minute of the episode. After losing Billie Piper, there were rumors that David Tennant would be leaving his role as the tenth Doctor in the middle of the fourth season of the new series in hopes of obtaining movie rolls. BBC News reports denials that he is leaving but plans beyond the third season are vague. Reportedly he is filming the third season, with no decision made yet on the fourth season. 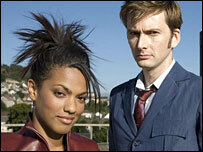 Freema Agyeman plays the Doctor’s companion in the third season, replacing Piper. The BBC also notes that Tennant came in first place in a poll of at Doctor Who magazine, beating out long time favorite Tom Baker. Slice of SciFi has an update on the remake of The Prisoner, which is a joint effort of the AMC network in the United States and Skye One in Great Britain. There have been rumors for quite a while that Christopher Eccleston, who previously played the tenth Doctor, will star but they have not been confirmed. A movie version is also being considered. Powerline has attempted to dispute the arguments that the pictures of Kerry sitting with only one other person in Iraq are faked by having a picture taken with someone holding today’s newspaper in the same spot. The pictures even have an incorrect date to show that the camera’s date was not set correctly when the original picture was taken. The pictures don’t totally disprove the possibility that the original picture was faked as in theory all the pictures could have been taken somewhere other than Iraq and the date could have been set back just for these new pictures. Of course that would assume that the room still looks exactly the same. Regardless, I’m inclined to believe that the original picture was real. Of course the picture is meaningless as a single picture of Kerry sitting with one person is hardly representative of what occufred on his visit to Iraq, especially in light of the other pictures (some posted here) showing Kerry with the troops. 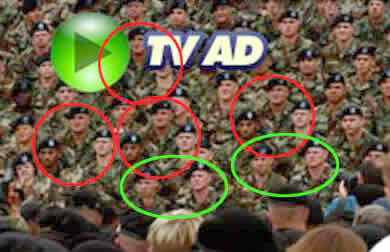 While Powerline refers to those who are attempting to show the pictures to be fakes as moonbats, the true moonbats are the right wing bloggers who claim that the original picture meant anything, and those who continue to claim that Kerry was insulting the troops when he botched a joke using his standard stump line about Bush getting us stuck in Iraq. Hopefully most people see this as a meaningless episode. For those who are primarily interested in the humor of the situation, check out my previous post to see how George Bush would have handled this, looking back at a 2004 campaign rally when they didn’t have as many soldiers in the crowd as they wished for. It’s a weird feeling seeing this photo of Sen. Kerry debated and decoded like some artifact out of the DaVinci Codes. It’s strange to me because I was there when the photo was taken. I traveled with Sen. Kerry throughout his Middle East trip. I’m his foreign policy staffer. Myself and Major McKnight were sitting right there when this photo was snapped. Snubbed? Alone? Hardly. 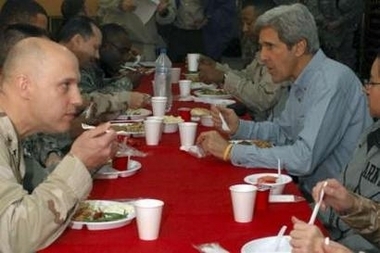 Sen. Kerry isn’t eating alone. In fact that photo is at an off the record breakfast meeting Senator Kerry conducted early Sunday morning with the very real Marc Santora of the New York Times Baghdad bureau and his younger colleague from the newspaper. The man shown in the green shirt across from Sen. Kerry is Marc Santora. Right after that interview was completed, Senator Kerry videotaped a message expressing his and the country’s support for the troops, to be shown on the armed services network in Iraq. Just the night before, Sen. Kerry was in that very same mess hall at a table where he ate dinner with about 10 U.S. soldiers. Additionally, Senator Kerry spent nearly a day and half (out of two days in Iraq) outside of the Green Zone because he felt strongly that he wanted to hear from troops on the front lines. On Saturday morning, he greeted U.S. soldiers in Basra, and also met many British troops while he was there. On Saturday afternoon, he flew to FOB (Forward Operating Base) Warhorse, where he had a town hall meeting with over 100 soldiers. On Sunday morning, he was briefed by U.S. commanders at a training camp for Iraqi security forces. On Sunday evening, he traveled to another FOB where he had a long dinner in the camp mess hall with soldiers, including many from Massachusetts. These troops are nothing short of amazing, and my boss knows that with every fiber of his being. He’s a combat veteran. He’s been there. Sen. Kerry knows that if you’re in public life, you’re going to have things you say and do taken out of context, sometimes photos even. It goes with the job. 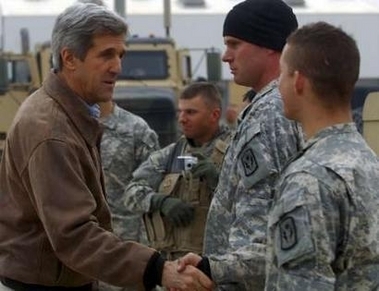 I just wanted to set the record straight about this photo not just because I was there and I know the truth, but because Sen. Kerry enjoyed his time and his conversations with the troops, and I hate to see anyone try to make some political hay out of all this or pretend this photo is something its not. George Bush tops two lists in a recent poll. An AP-AOL poll found that Bush is the Top Vilain of 2006, beating out Osama bin Laden, Saddam Hussein, and Satan. That doesn’t mean that the Bush worshippers aren’t still around. George Bush also topped the Hero of the Year list with 13% naming him their hero. Some say it is Photoshopped, questioning if this was even taken in Iraq when looking at the flags in the background. TPMmuckraker notes that the picture’s embedded data shows a date of January 9. 2006, but perhaps the camera’s date was set incorrectly. Shaun at Upper Left raises further questions upon lightening up the picture. There have been comments that this was taken at the embassy where few soldiers were even present, and someone saying he was there reported that Kerry didn’t enter the room until near the end of breakfast when few people were left. Besides, how many soldiers are going to just walk up and sit down next to a Senator who is busy talking to someone else? All in all, this was a pretty desperate smear, but it is typical of the conservatives who typically resort to this nonsense but never show the guts to discuss Kerry’s actual statements and positions. Afterall, these are pretty much the same people who have been twisting Kerry’s recent joke about George Bush getting us stuck in Iraq to be a smear on the troops. It’s much easier to distort things than to respond. If we wanted to resort to this type of attack I imagine it would be possible to find a picture of Bush with only a couple of people and claim other were ostracizing him. My take on this at the Unofficial Kerry Blog in October 2004 is reposted under the fold.